We decided to go to Cuzco after our trip in Iquitos, the largest metropolis in the Peruvian Amazon which is connected to the outside world only via boat and plane. We chose to travel to Iquitos with an adventure via a cargo boat on the Amazon River that we took from Colombia. You can read more about this amazing trip here. So after this lengthy boat trip, the best way to get out of Iquitos was via air so we decided to go a bit out of our budgets and paid $325 for a one-way plane ticket with a connection in Lima. 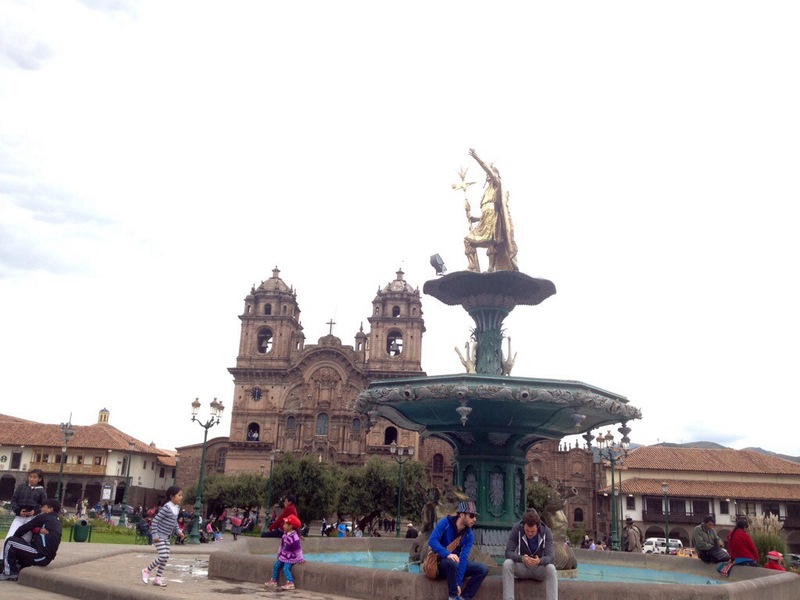 Once we landed in Cuzco and completed negotiating the taxi fare successfully (20 soles max! 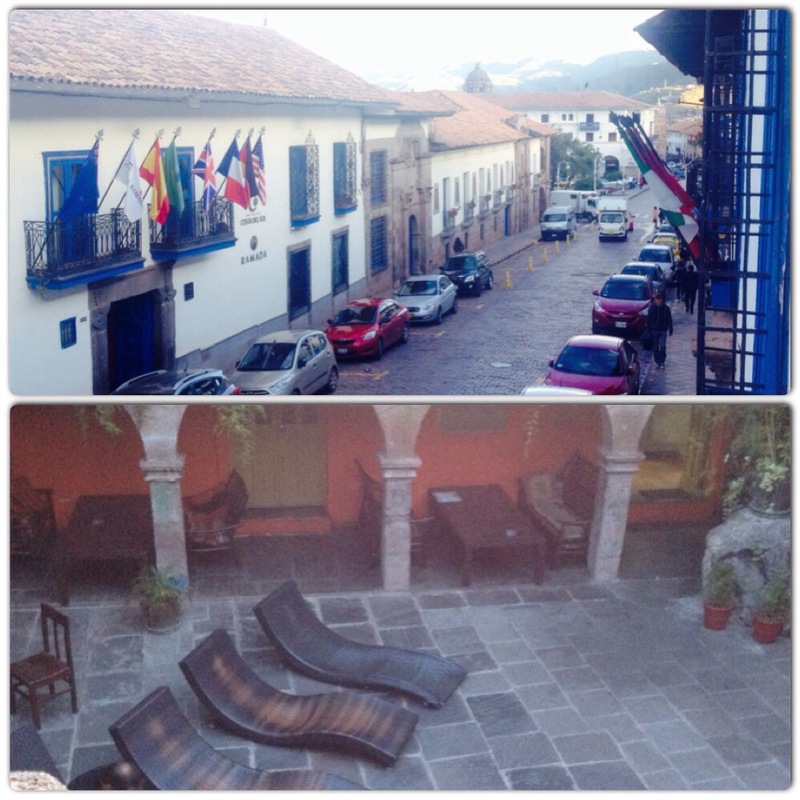 ), we checked into the backpackers haven called Eco Packers for 28 soles/night ($9). If we had stayed 1 more night, we could benefit from the “stay 4 nights, pay 3” deal but we were pretty overwhelmed by the touristiness of Cuzco and decided to move to Pisac earlier. The hostel had a large courtyard with sunbathing chairs, tables, bar, tv room, pool table, free breakfast (which we found out about coincidentally on day 2) and a lot of beds. They also have a desk inside that organizes various sightseeing trips, which would save you from talking to other tour guys that stop you on the street every minute. 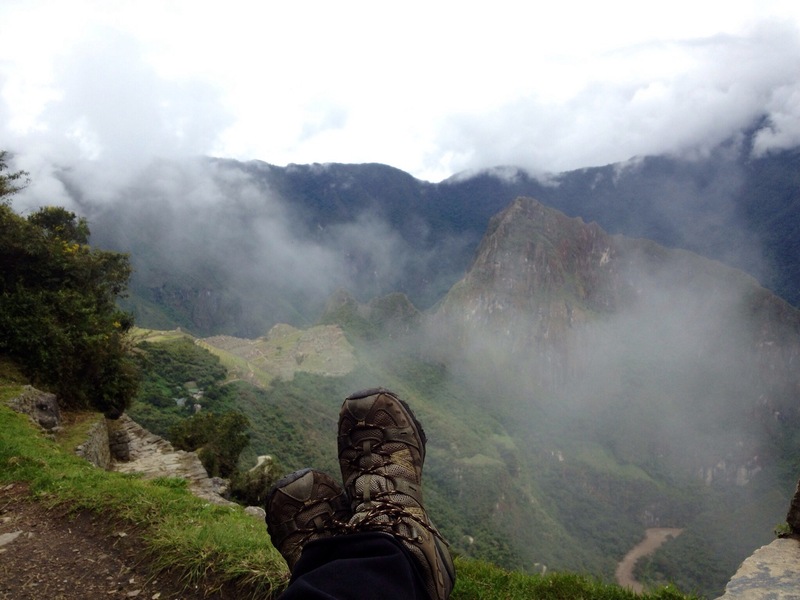 Cuzco is located 3300m above the sea level, which causes altitude sickness in many of its visitors. We were lucky to shake off the mild symptoms in a couple of days without the help of a drug or coca leave products. The continent’s oldest continuously inhabited city contains massive Inca-built walls, narrow cobblestone streets and colonial architecture along with a ton of restaurants and stores for tourists. After the heat of the jungle where we came from, Cuzco felt super cold both day and night except for a few times the sun peaked between the clouds and without much thinking, we found ourselves negotiating the prices for alpaca sweaters and scarves. 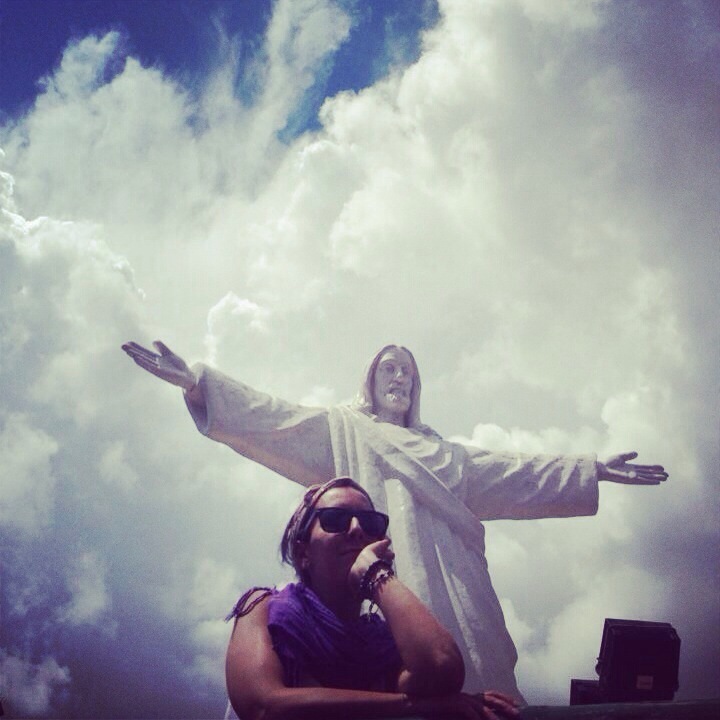 We were told that we were in the rainy season and it was even colder during the high (but dry) season from May-Aug.
Cristo Blanco is located on top of a hill high above Cuzco and it was built by a group of Christian Palestinians that were seeking refuge in Cusco in 1945. 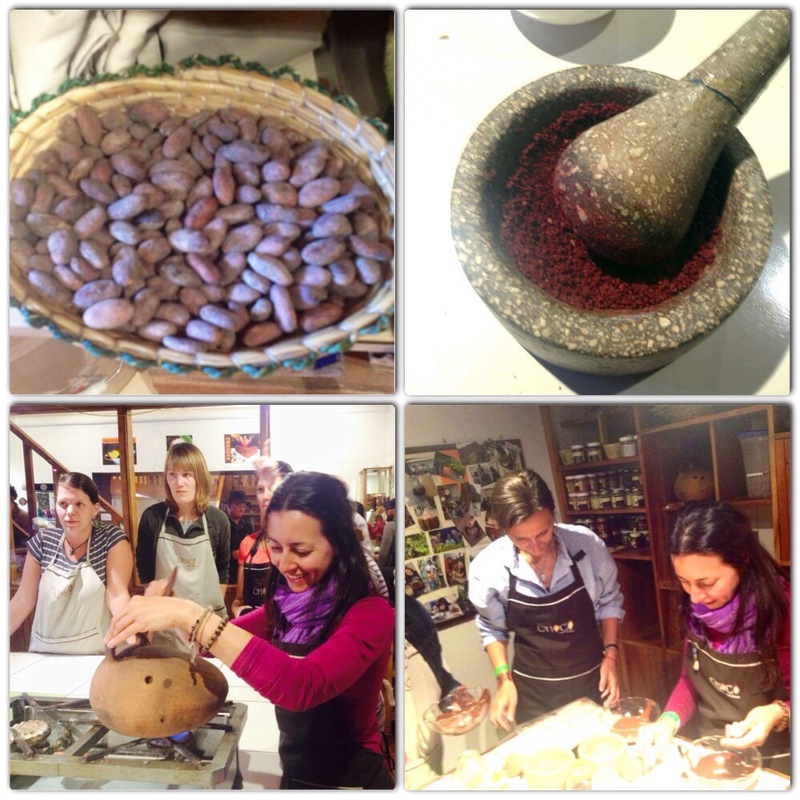 -Organic chocolate making workshop @ the Chocolate Museum– 70 soles, 4 hours + bonus: you take the chocolate you’ve made! I really liked learning about the history of cocoa and the process of chocolate making. – Jack’s – good American/Peruvian/international food in San Blas if you are homesick. – The Restaurant next to Jack’s that served menus for 7 soles. – La Caverne de Oriente– French restaurant with prix fix lunch for 18 soles, good food and nice view of the town from the 2nd floor (in San Blas). – El Meson de Don Tomas- sort of upscale restaurant where we tried the traditional Peruvian dishes alpaca stroganoff and aji de gallina (Creamy hen stew with mushrooms). They were both delicious. 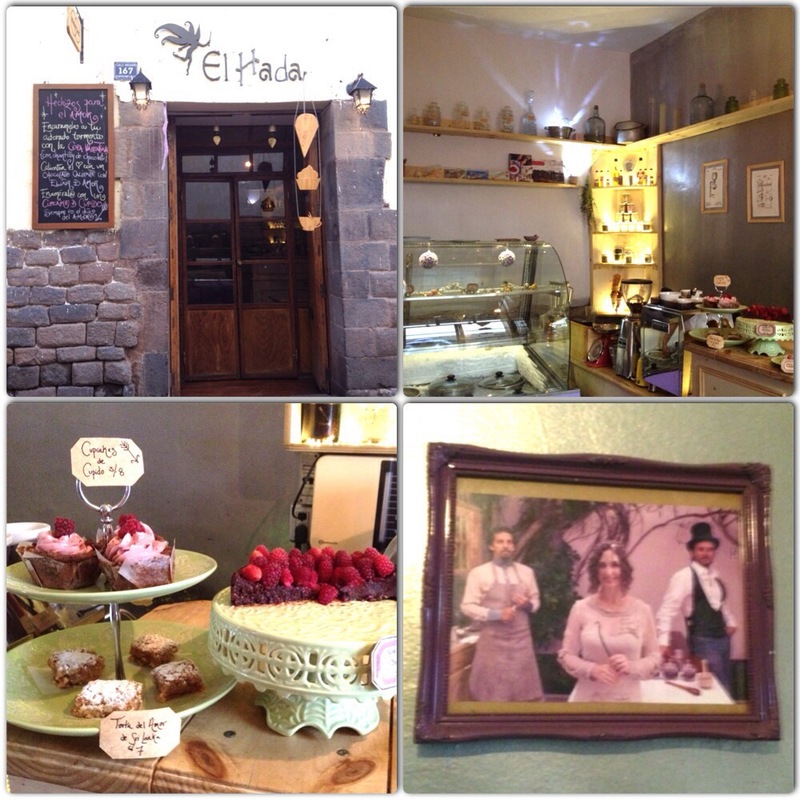 – El Hada – Yummy ice cream and a cute shop that reminded us of the stores in Williamsburg, Brooklyn. Try especially the chocolate and levander flavored ice cream! 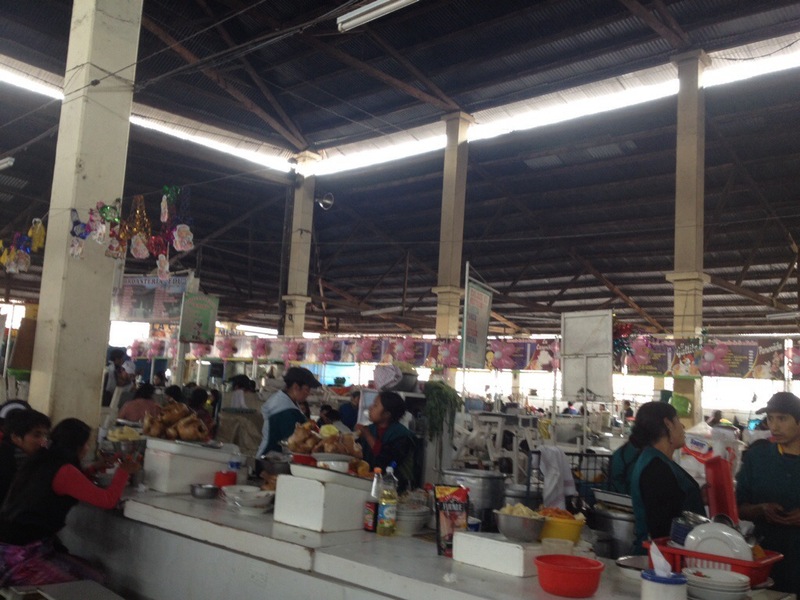 – San Pedro market – good for fruits and vegetables and sweet water fish (trout and something else) ceviche. Later on, we were told that we had been lucky that we didn’t get a stomach virus from the ceviche, oops! Chocolate making workshop: the process from beans to yummy creamy chocolate! Say hello to our friendly instructor-became friend Manuel if you happen to take the workshop. He was off to a Vipassana meditation retreat right after the workshop. After a few days in Cuzco, our new Peruvian friend Miguel whom we connected with as a good friend’s introduction, took us from our hostel to go to Pisac, the quieter and more artizanal town located 40 mins away from Cuzco. There are also many expats who have chosen to live in this lovely town. 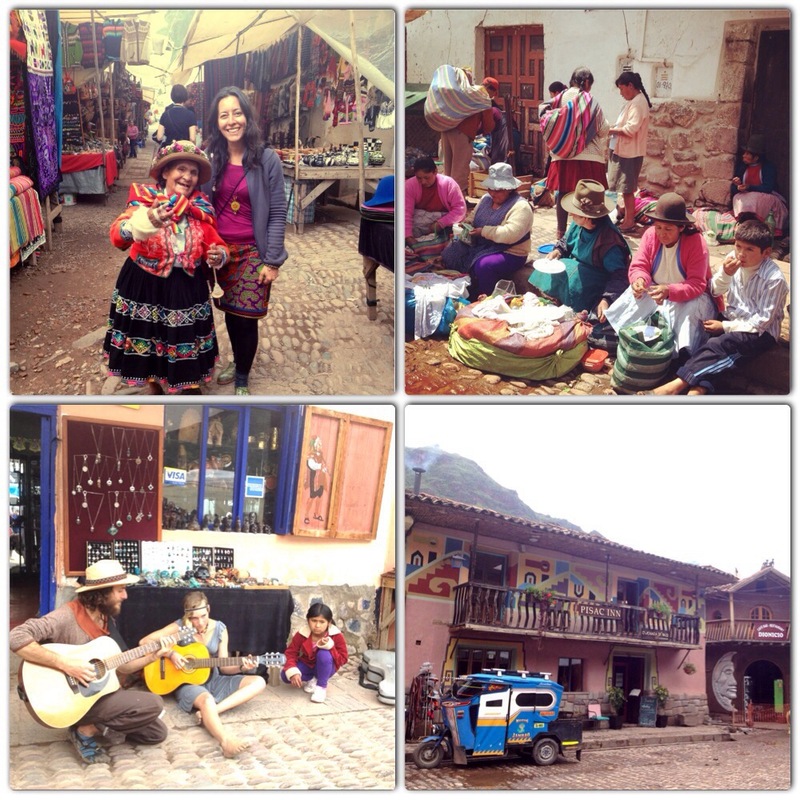 As per Miguels introduction, meeting the lovely person Daya solved our accommodation problem quickly as he happened to own Prasada Pisac, which was one of the 2 vegan restaurants well known in Cuzco and Pisac. We decided to stay in one of the double rooms located upstairs of the restaurant for 20 soles/person/night ($7) during the 1.5 weeks we would spend in Pisac. Even tough the town was empty and most of the stores were closed due to the low season, we decided to stay in Pisac since it was warmer (2700m) and quieter than Cuzco and we could wake up to the beautiful views of the mountains every day. On our first day, we met our Spanish teacher Jesus who became a good friend and our enthusiastic tour guide quickly. He was kind enough to answer our endless questions, take us to a ghost town for coca leave readings and give us a tour of the Pisac Ruins without asking anything in return. If you want a jungle tour or Spanish lessons, you can reach Jesus at his cell 992479723 or Facebook.com/Jesus.amadeus. The evening we arrived in Pisac, we were invited to join a San Pedro (Huachuma in Quechua) ceremony with a group of 4 Peruvians and 4 European travelers. The ceremony started at 8 pm and ended with the sunrise. We sat around the fire and drank 4 cups of San Pedro in the opening of each door (south, north, east, west) along with smoking tobacco and giving short speeches around thanking to whatever we are grateful for in our lives. During the night, various medicine songs were sang in the company of a drum and rattle, which reminded me of the peyote ceremonies in the Vision Quest camp in Colombia a few weeks earlier. Unlike the ayahuasca experiences I’ve had so far, I didn’t have any visions nor felt connected with nature during the night. I just got drunk and tired pretty easily. Except for one of the girls, no one got sick and purged. For me, the ceremony was pretty mellow and friendly since we could also talk and joke around between songs. I left Miguel’s house skeptical about drinking San Pedro during the day tour in Machu Picchu in a couple of weeks. 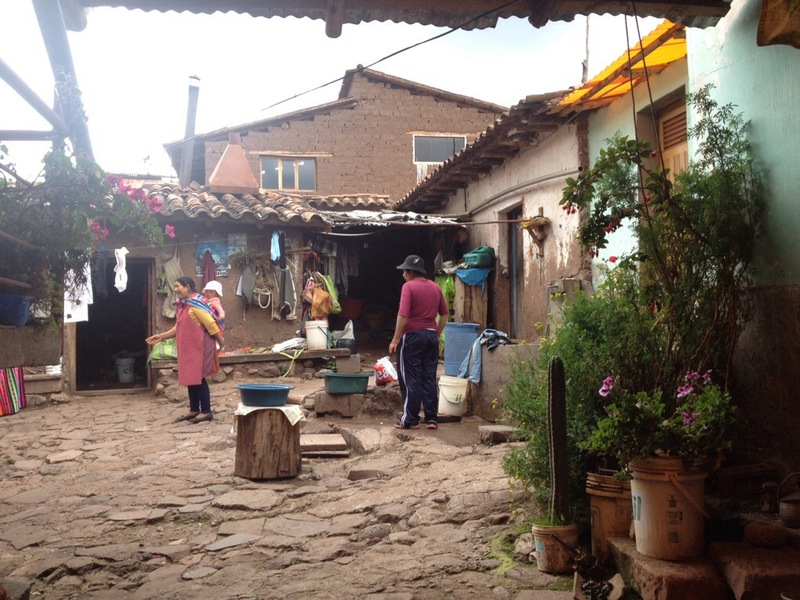 If you are interested in doing San Pedro ceremonies and/or walking tours anywhere in the Sacred Valley, I highly recommend you to get in touch with Miguel. You can reach him at: pichunator@hotmail.com. 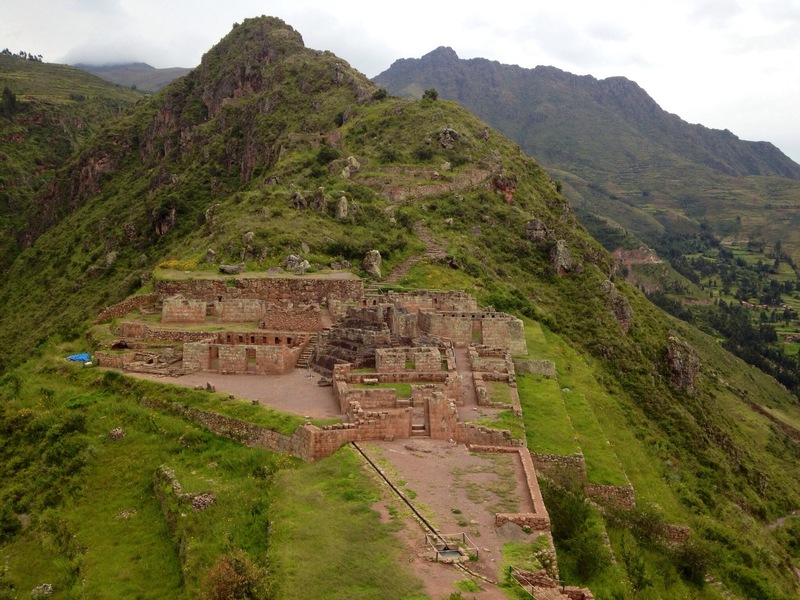 – Pisac Ruins: With Jesus’ expert opinion, we took the back way to avoid paying the entrance fee to the ruins. 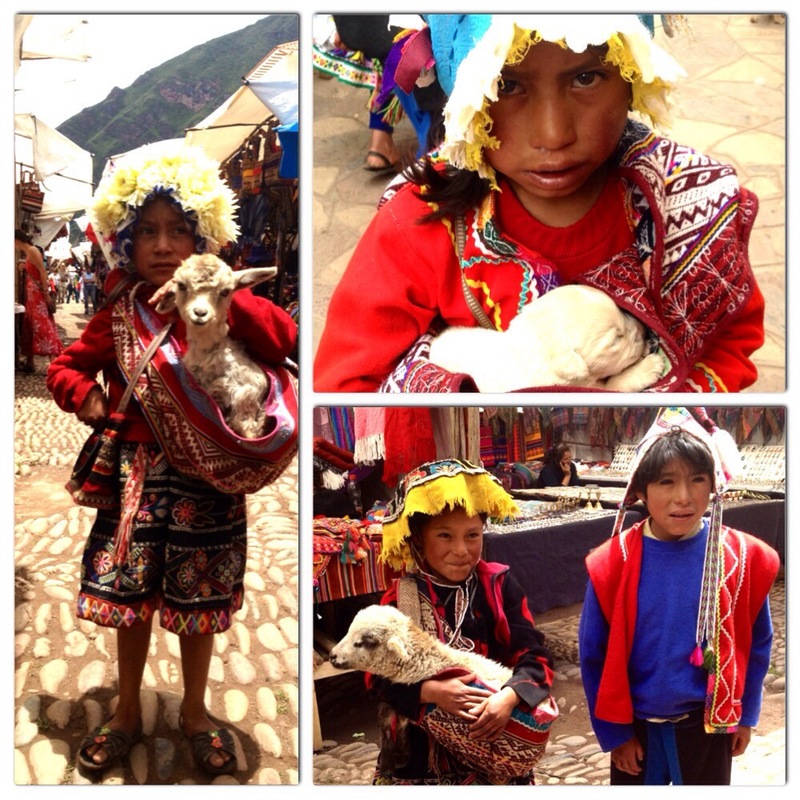 A 4 soles taxi ride from Pisac dropped us off at the bottom of the sacred mountain. After the adrenalin rush from crossing a bridge made out of 2 logs rushing over a crazy river and a super steep climb on the terraces, we were on the top of the mountain among the ruins in about 40 mins. 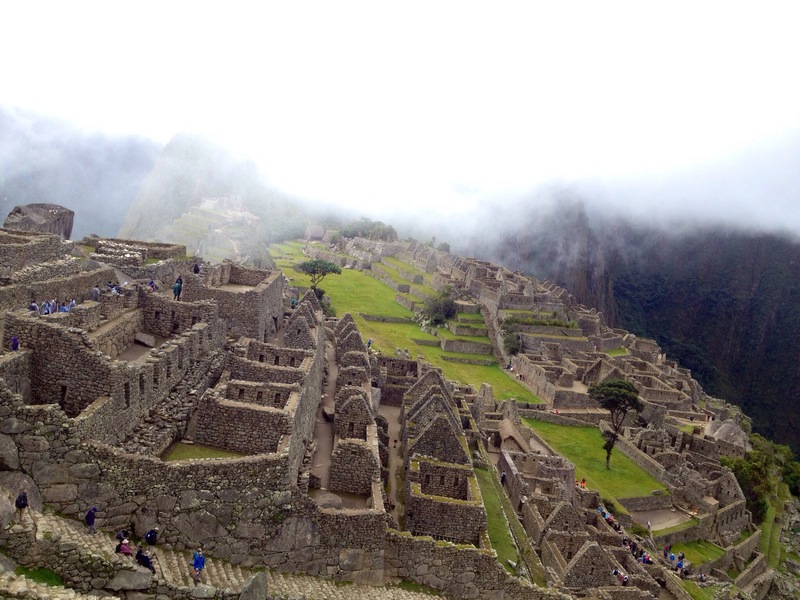 Apparently there were 2 reasons for the Incas to build these amazing terraces in the 5th century: 1- to prevent erosion 2- to farm different types of produce. Beside the terraces and massive stone walls, it was petty cool to see the ceremonial center and several working water channels. We went down from the way regular people used and saw two waterfalls. 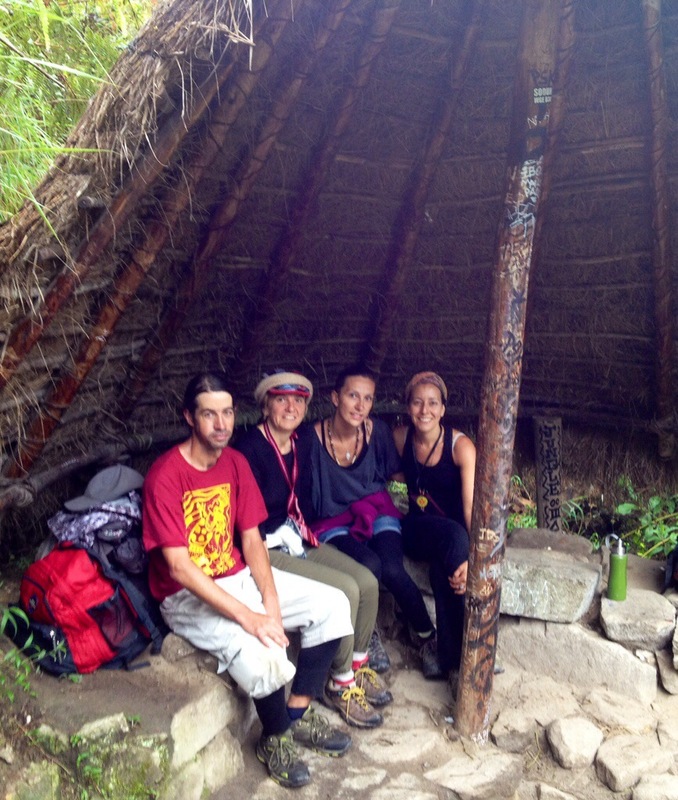 – Machacancha hot springs/baños termales: We chose these hot springs due to their proximity to us so we could go quickly and heal our bodies after the 1.5 tough months we had left behind. In order to get there from Pisac, we took a collectivo to Calca 30 mins (2 soles) and another collectivo from Calca to Machacachu 20 mins (2.50 soles). We got to the place pretty easily and ended our visit quickly. Unfortunately, the water was not hot and the pools were filthy. I don’t recommend you to waste your time and money in here. You can go to Lardes instead, which is another place located 2 hrs away from there. Unfortunately I didn’t have enough time to do it. – Coca leaf reading with Don Martin Pinedo Acuna: We had heard about this shaman from a friend we had met during the chocolate workshop and after a few google searches, we were convinced to visit him to ask about what was awaiting us in the future. As soon as completing our daily morning Spanish classes, we took a collectivo to Cuzco and a cab to Huasao, which is a town 20 mins away from Cuzco. On the way back, we paid 1 sol per person to the collectivo to get back to Cuzco. After asking a couple of ppl on the street where Señor Martin lived or where the house with the condor was, it wasn’t too hard to find it. When we got to his house with a cute courtyard in which his wife was doing laundry, we found out that there was someone who had her reading in process inside and a lady with 2 kids waiting outside. We sat and waited around 30 mins and watched the rain clouds develop and explode on us. First, I went in with Jesus who had kindly accepted to help us with the translations (and because he was curious too!) and sat across from Don Martin who was sitting under a giant stuffed condor that gave house its name. He had a smirk on his face during the reading, which gave me the impression that he was joking about me and my future. He told me a few things that matched my current status and some matrimonial and kids news that I wasn’t very happy to hear about so I decided to take this experience lightly. The reading must have taken 15-20 mins before I left his room to leave the hot seat to Daria. Once Daria was done, we both paid our 20 soles donations and left the rainy town of Huasao with question marks in our heads. – Ulrike’s cafe – best coffee, food, desserts (carrot cake and kahlua cheesecake mmmmm! ), 2 floors + roof terrace, couches, good wifi connection. We spent most of our time here whenever we weren’t on a tour. – Blue llama– decent food and seemed to have the only working wifi in town for a couple of days. Feb 14 (Valentines Day & Full moon). 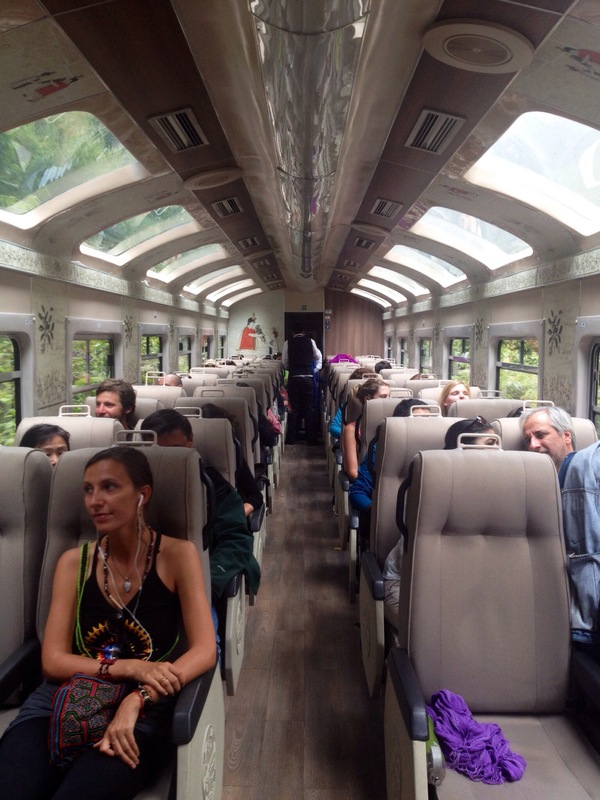 We started our trip by taking a collectivo from Pisac to the grifo (gas station) at Urubamba (3.5 soles) to meet with the rest of the group and then continued to Olantaytambe where the train station to Agua Calientes was located. The rest of the group was consisted of 5 amazingly fun and brave Turkish ladies who reminded me of the women of my family in Turkey. And of course we all bonded very quickly and had a lot of laughs together during our 2 day MP trip. 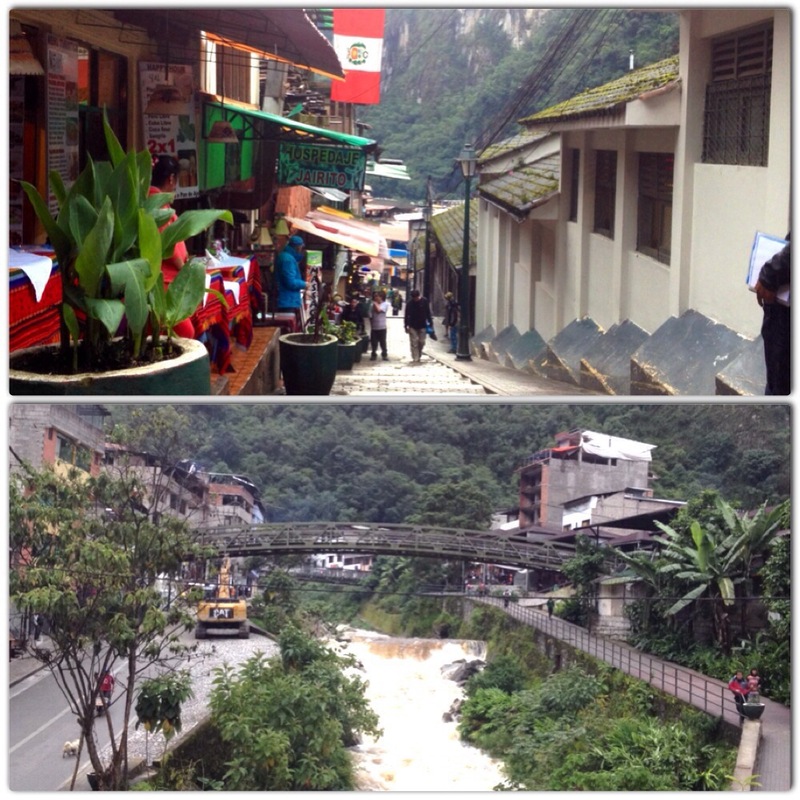 Aguas Calientes is a virtual island that is cut off from all the roads to which you can only reach via train. 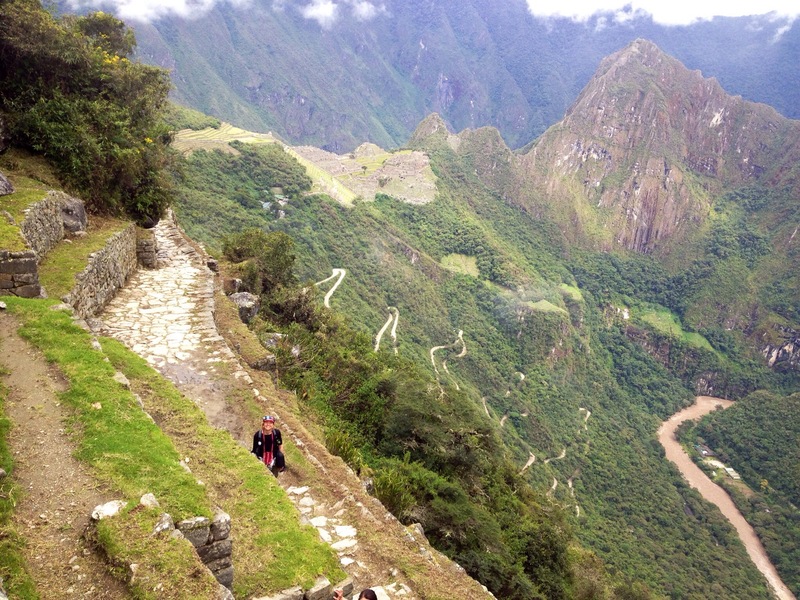 It is used by hundreds of tourists to stay over night to gain a head start to climb up to Machu Picchu early in the morning. Hence, it is over priced and super touristy. 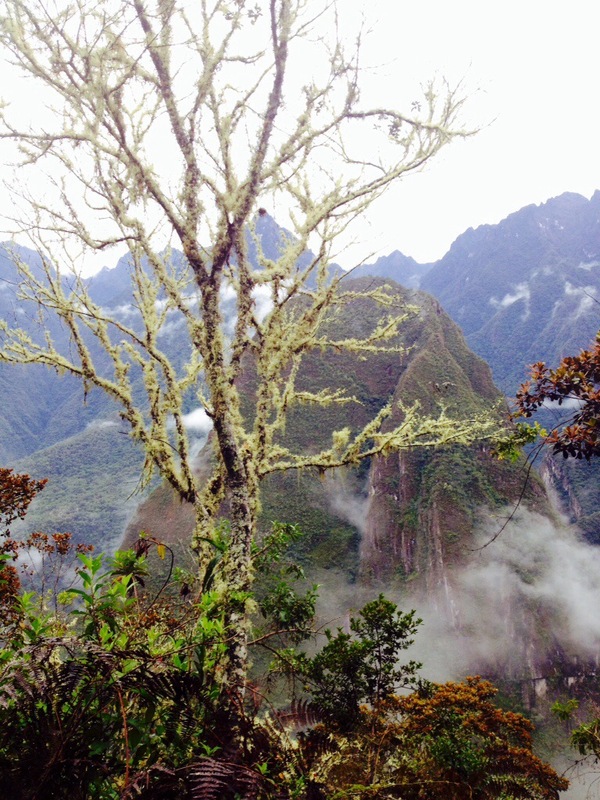 It is also home to the Aguas Calientes (aka baños termales or hot springs), a rushing river, glorious green mountains and cloud forests, which hide the tops of the mountains. Once we got to town after a 1.5 hr train ride, we checked in to the first hostel we saw right by the train station due to the heavy rain that welcomed us to the town. We got a double room for 20 soles/night w/private bathroom. I am not mentioning or even remembering the name of the hostel as it’s not a place I’d recommend specifically. Since our room was right by the rushing river that was flowing like nothing I had seen before, we could hear the noise very clearly from our beds, and it added a nice ambiance to our night. 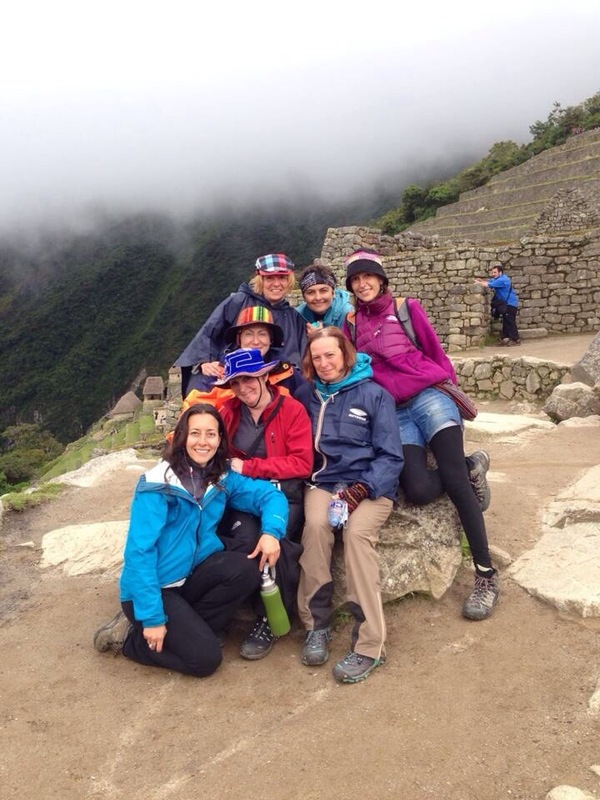 The next morning, we met with 2 ppl from our group in the lobby at 5:45 am to start the hike to Machu Pichu (50 mins) while the rest stayed behind to take the bus (25 soles) to the top (20 mins). The pictures speak for themselves but I can add to them that I understood why millions of visitors thought the MP was a sacred place since its discovery for the modern world by an American historian in 1911. It is fortunate that the Spaniards were not able to find and demolish it since it was hidden in the jungle. Apparently there are different beliefs about the citadel but there’s no evidence to prove any of them. 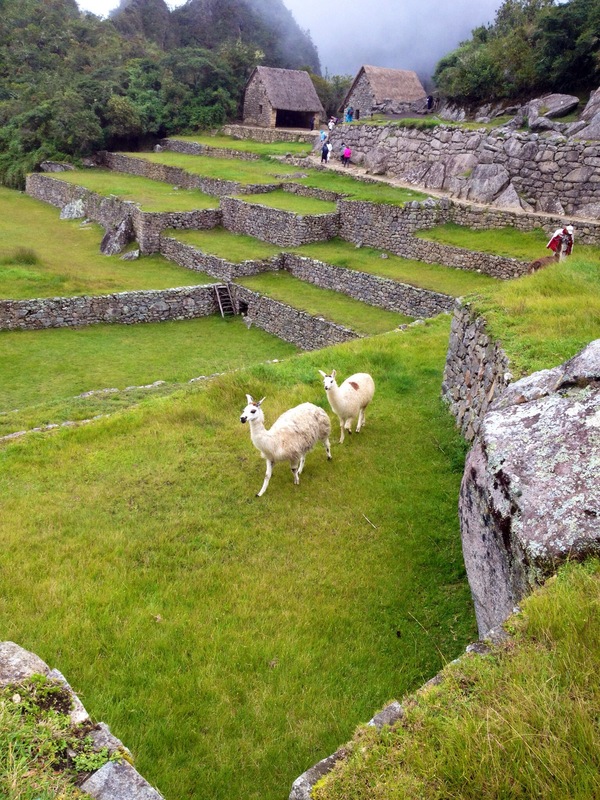 It might have been made by the Incas to preserve the Inca culture or they could have just discovered the town when they had migrated to this mountain. Whatever the case is, the high quality of the stonework and architecture indicate that the place was used as an important social and ceremonial center at the time. 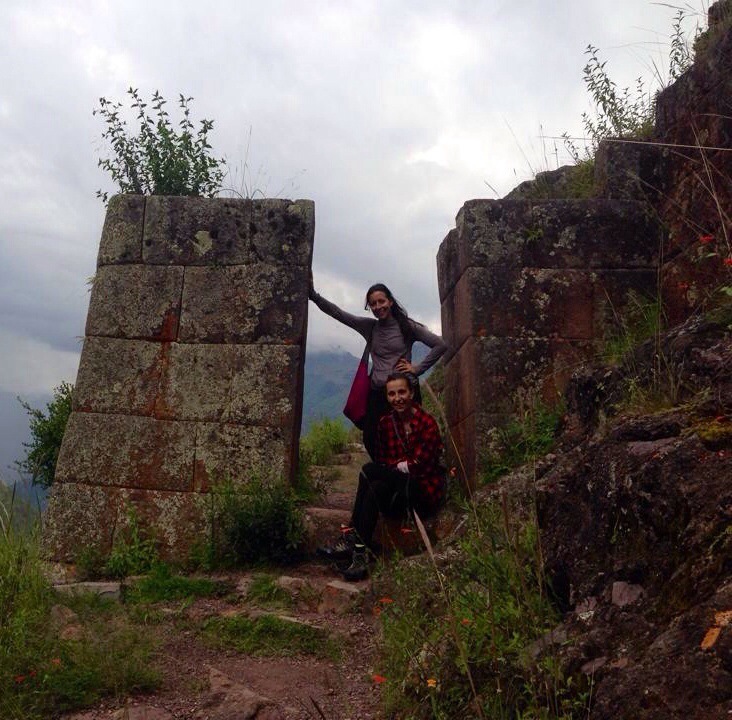 Our walk to the Sun Gate, which was our first destination, was rewarded by the extreme happiness and peacefulness! Everything was going alright and I was enjoying the view with awe. However, the universe had a different plan for me. After having eaten from the most unhygienic places in South America for the last 1.5 months, I managed to get a stomach bug the day of our much anticipated trip and had a diarrhea during the trek! And let me remind you that there are no bathrooms after you pass the gates of MP, none, zero! This caused me to run among the mazes of the Inca town and pushing the tourists out of my way to get out to the bathrooms, which kinda added more excitement to my 12 hr day in MP. After having done that twice, I decided to wait for the group outside and missed the last part of the tour. Tip: stay away from San Pedro when you have an upset stomach! Sacred Valley and Machu Picchu were amazing places to see and I believe they have a special energy that never leaves you. 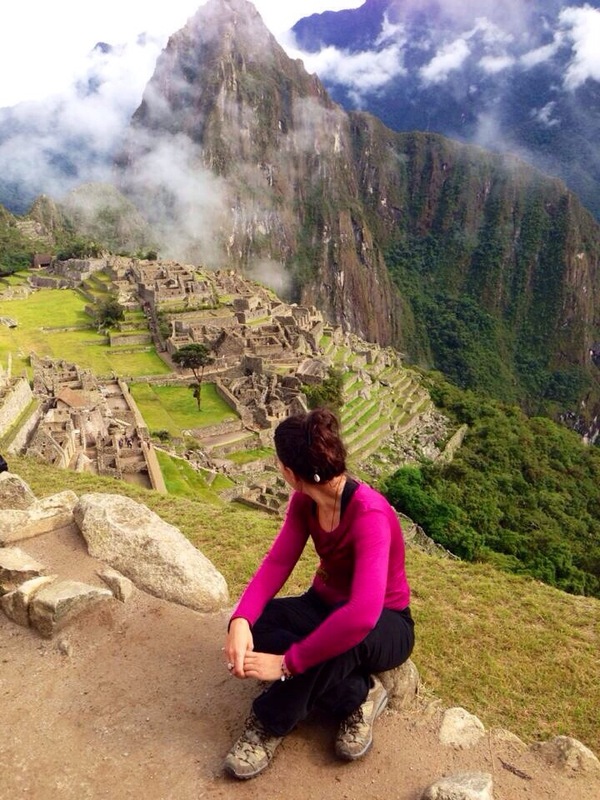 As soon as I left Peru, I started planning my next trip. Also I’d like to mention that some people I met in Pisac (locals and expats) became good friends and I am humbled by their hospitality and open hearts. 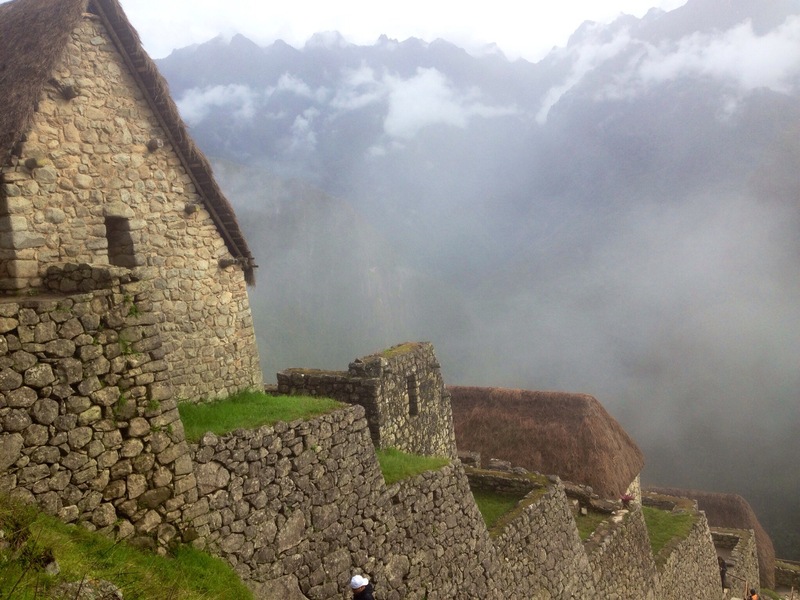 I am extremely inspired by Peru. See you later beautiful mountains. This trip was surely too short, I shall see you again! lovely to do hiking…one way from 82km following the train rails…inkredible! also u can enjoy of more ruins without nobody..and the nature is amazing! 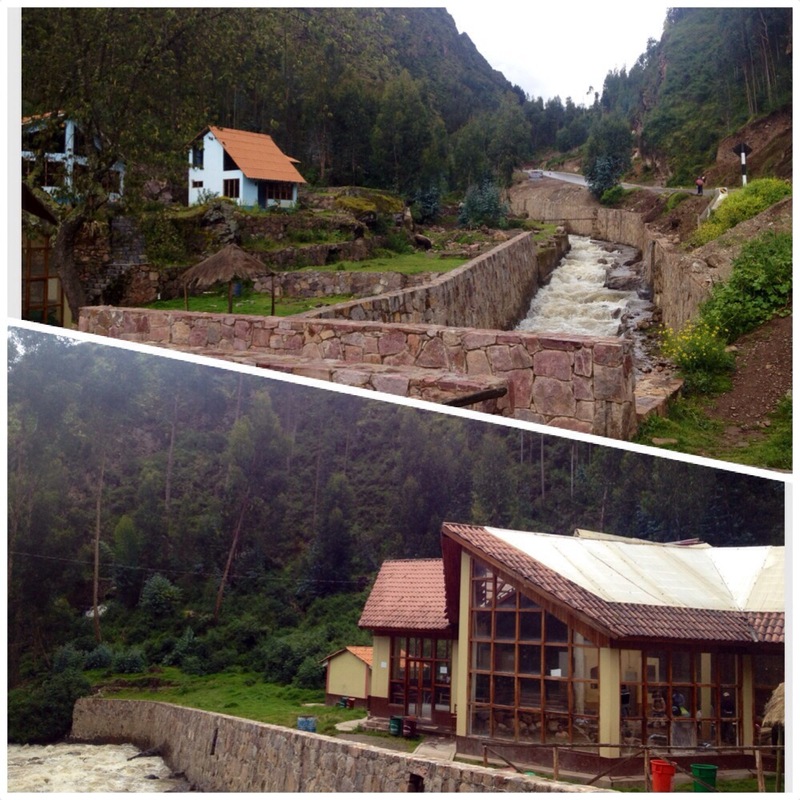 the second way aguas calientes – hidroelectrica- santa teresa- santa maria! was beautiful! !